Q. Will TimePilot work on a Mac? I am using your Vetro clock system and the TimePilot Central software but we have just switched to Mac. A. The short answer is maybe. We've done some very limited testing on a MacBook Pro running VMWare Fusion software and Windows 7, and TimePilot seems to run correctly, but we don't recommend it because we can't help you very much if you have problems. (We're a Windows-based company.) If you really want to give it a shot, we have a 30-day-no questions-asked return policy if you bought the system directly from us, so you can return it if it doesn't work for you. A. That feature is available—and displayed automatically—only if the clocks are attached to your network and Vetro Data Manager is running. Here's why: The accumulated hours aren't calculated inside the clock itself; they're calculated by the TimePilot Central software on your PC or server. Therefore, if you use the USB drive to transfer clock-in and clock-out data, there's no way to get constantly updated information to the clock. In comparison, if your clocks are attached to your network and Vetro Data Manager is running, there is a constant connection between the clock and the PC-based software and up-to-date accumulated hours are displayed. TimePilot Tips: Viewing all your employee profiles at once, TimePilot on a Mac, and displaying accumulated hours on a clock. TimePilot Best Practices: Job Costing: Keeping track of individual tasks. Cool Stuff: Free Windows 7 Cheat Sheet. The Deal: Free TimePilot PC when you buy Vetro or Extreme Starter Kit. Your TimePilot system can also be used for keeping track of the time taken by particular jobs. Commonly known as “job costing,” this feature can be used to determine the amount of time an individual project takes during the workday or how long an employee takes to complete a particular project. All you need to start “job costing” is iButtons in different colors. They’re available in 12 colors at our web site. Using the remodeling company as an example, we’ve put together a report on how to use your system for job costing. It’s a free PDF and available here. It’s also available at our web site’s Support Center, along with lots of other helpful information. Buy a TimePilot Extreme Starter Kit or a TimePilot Vetro and get TimePilot PC (single-seat version) for free. 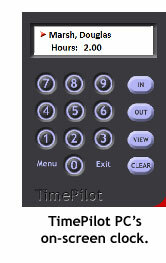 TimePilot PC allows your employees to clock in and out at a computer. This single-seat version can be installed on one computer, and up to 2,000 employees can clock in and out by clicking the image of the timeclock on the computer screen. TimePilot PC works with Vetro or Extreme, so that employees can clock in at Vetro or Extreme and clock out at the computer running TimePilot PC. If you want to install TimePilot PC on more than one computer—to let each office employee clock in at out at their desk, for instance—all you need to do is purchase more inexpensive seat licenses. Learn more about TimePilot PC here. Many of our customers are moving up to Windows 7, the latest operating system from Microsoft. It has all kinds of new features, but it's not particularly easy to find out how to use them.